That’s right! We’re back at it again, and this time we’re keeping it classy with a Malibu Classic theme at one of the most beautiful settings Malibu can offer. Go all-in for children in Armenia by spending this year’s charity poker tournament in the breathtaking Villa Mara beachside mansion. Your enjoyment is our number one priority so we’ve catered to your every need. Food? YES! Expect delicious meals and snacks to keep you happy and satisfied. Hookah? YES! Hookah service will be provided throughout the event. DJ? YOU BET! This isn’t your run-of-the-mill poker tournament. Expect to party into the night with great music and dancing. 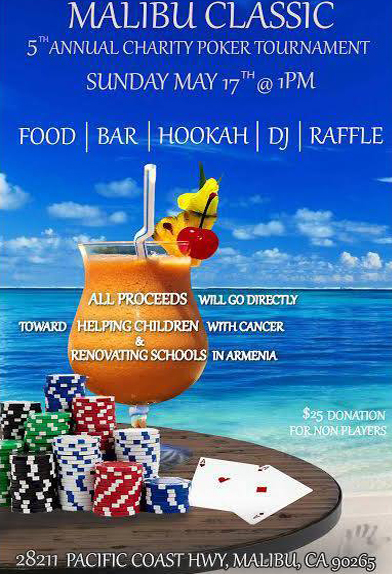 Now after all is said and done this is a CHARITY event so we urge you to come and enjoy with us while keeping in mind that ALL proceeds are going to renovating kindergartens in Armenia and to the fight against childhood cancer. Parking will be available at St. Aidan’s Episcopal Church in Malibu. You will then be shuttled up to the house.